Dekha Ibrahim Abdi was an ethnic Somali woman, a Kenyan citizen, a remarkable community worker and peace-builder, a devout and very spiritual Muslim woman . . . who found her ‘second spiritual home’ among Quakers at Woodbrooke. Tragically, she died in a car accident on 14 July, along with her husband, as they were on their way to a peace conference. She leaves four children. Dekha came from Wajir in northern Kenya, an area prone to drought, poverty and conflict. Her brother says of her that she was ‘always a leader’ – even when she was in school. For a young woman to take leadership in such a traditional society was a remarkable thing. Dekha first came to Woodbrooke, back in the very early 1990s, when she enrolled as a participant on the 11-week conflict transformation course run by Responding to Conflict. RTC has its offices on the Woodbrooke campus and at that time they ran twice yearly residential courses, housed in Woodbrooke. Dekha returned at a later date as a tutor on a similar course, and some years after that worked for a year as a full-time staff member for RTC, based at Woodbrooke. Along with other RTC people she was instrumental in creating and developing the Coalition for Peace in Africa (COPA). 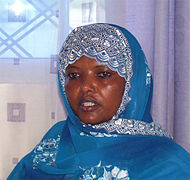 Her work in her home region was recounted in a training film, commissioned by RTC, called The Wajir Story. The film can be watched online (35 mins), and the accompanying training materials are freely available. "... for showing in diverse ethnic and cultural situations how religious and other differences can be reconciled, even after violent conflict, and knitted together through a cooperative process that leads to peace and development". In relation to the award, you can watch a video of Dekha and read a Question/Answer written interview with her. In 2009 Dekha was awarded the Hessian Peace Prize – another global award (based in Frankfurt). There are tributes to her on the websites of American Friends Service Committee and Peace Direct. On YouTube there’s a film of her talking about her work, called ‘A Kenyan Superhero’. And she was featured this week on BBC Radio 4’s ‘Last Word’ programme (29 July; she’s the second person featured, about 8 minutes into the programme). In person Dekha was warm, inspiring, and gave no sense of thinking herself a global superstar. She loved Woodbrooke, visited often, and found there a place of refreshment and rest. Among Quakers she found spiritual ‘cousins’, and one of my strong memories of her is a few years ago when she happened to be at Woodbrooke during Ramadan. Amid her many meetings and other work, and among the normal social mealtimes that are a feature of Woodbrooke’s dining room, she quietly and unobtrusively kept the fast. Another of my memories is of her talking to a Woodbrooke course group who were spending a week exploring ‘pilgrimage’ (including reflection, discussion, and a day’s pilgrimage walking). Dekha came in one evening and talked about her then quite recent experience of Hajj. It was a powerfully inspiring talk about what had clearly been a powerfully inspiring spiritual experience for her. If you Google ‘Dekha Ibrahim Abdi’ you will find many more websites than I have mentioned. She was much loved and is greatly missed. Postscript: there is now (10 August) also an obituary in The Guardian, written by Scilla Elworthy. My apologies to regular readers for the long gap since my last post - I've been very caught up with preparations for the imminent Yearly Meeting Gathering at Canterbury.